When I was younger my mom sometimes covered chicken with egg and fried it. We often had it with chinese food, so I always assumed it was an asian thing. So the one day, after being tired of breaded fish, and having some ricotta in the fridge, I thought of covering fish in egg and doing the same thing. I turned out pretty well. 1. 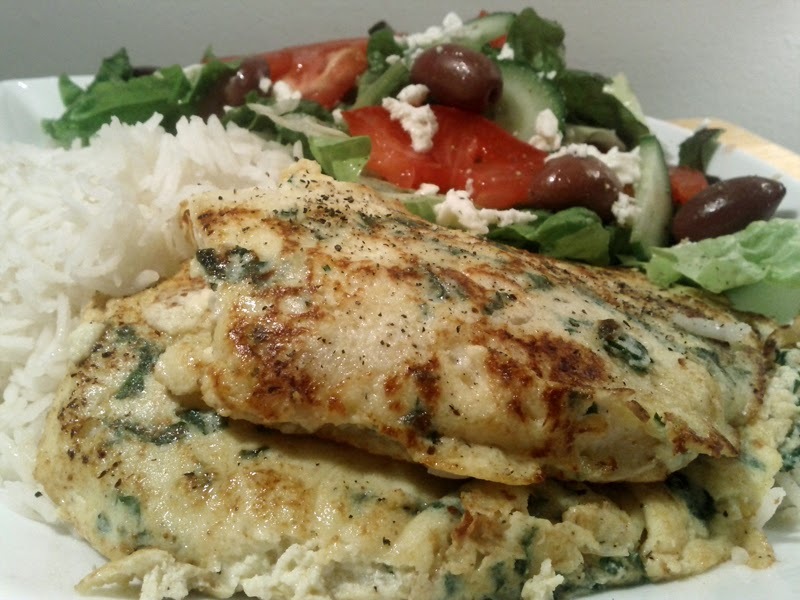 In a bowl, mix two eggs, a handful of chopped spinach, and about 1/4 cup ricotta cheese. Beat together with a folk until smooth. And season with salt and pepper. 2. Dip fresh, or defrosted tilapia, into the egg mixture. After dipping, put fish into a frying pan. And cook both sides until egg is a golden brown. The fish will probably be cooked through at that point. If you want the egg mixture to adhere better, dip the fish in flour first, and than the egg. But it won't be gluten free at that point. 3. Eat with maybe some rice, and a greek salad, like the picture above.